County swimmers are just champion! 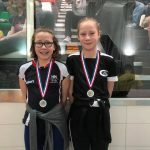 COUNTY swimmers won a host of medals at rounds two and three of the East District Age Group Championships in Glenrothes. 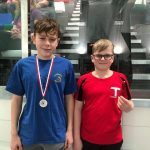 Round two – held just before Christmas – focused on 50m races in all four strokes and East Lothian Swim Team (ELST) members picked up 20 medals. Stefan Krawiec claimed gold medals in the freestyle, backstroke and butterfly, with Louisa Stoddart picking up golds in the butterfly and breaststroke and silvers in the backstroke and freestyle. 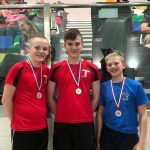 Zack Slater bagged gold, silver and bronze in the freestyle, backstroke and butterfly respectively, while there were also medals for Calum Peebles, Luke Hornsey, Hannah Wardell, Ross Anderton, Iona Wilson, Christen Russell, Helen Stoddart, Aidan Ballantyne and Bridget Lemasurier. ELST swimmers did even better in last weekend’s round three of the championships, over 200m, coming away with 29 medals. Krawiec lead the way with four gold medals as well as two national age group records in the backstroke and freestyle. 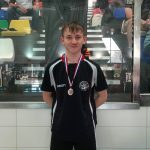 Slater continued his excellent run of form, claiming golds in the freestyle and backstroke, with a bronze in the butterfly. Ballantyne had a storming meet with golds in the breaststroke and freestyle and a bronze medal in the butterfly. Peebles claimed silver medals in the backstroke and freestyle and bronze in the breaststroke and butterfly. 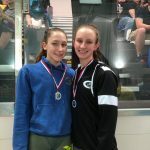 In the girls’ events, Lotte Gilhooly and Bridget Lemasurier claimed gold in the breaststroke in their respectively age groups. Tegan Black finished a close second to Gilhooly, picking up the silver medal in the breaststroke and also claiming bronze in the freestyle. 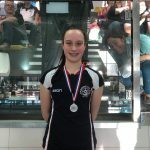 Louisa Stoddart continued her excellent run of form at this year’s championships, with silver medals in the butterfly and freestyle. There were also medals for Luke Hornsey, Luke Porteous, Owen Williamson, Hannah Wardell, Grace Courtney, Lucy Lucas, Iona Wilson and Christen Russell.